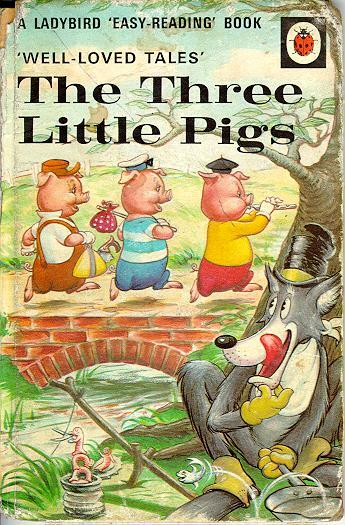 Once upon a time there were three little pigs who lived with their mother. One day their mother told them they were old enough to go out into the world and make a living for themselves. She said "Watch out for the big bad wolf, because he will eat you." She also told them "Build your houses nice and strong so that you will be safe from the wolf. Then she said "Good-bye my sons and good luck!" The three little pigs then went their separate ways. The first little pig saw a man stacking straw. The first little pig asked the man "May I have some of that straw to build a house?" The man agreed and the first little pig built his house very quickly. It wasn't a very strong house. One day the big bad wolf came and knocked on the first little pig's door and said "Little pig, little pig, let me come in." And the little pig answered "No, no, I won't let you come in, not by the hair on my chinny chin chin. "Well," said the wolf " then I'll huff and I'll puff and I'll blow your house in. So he huffed and he puffed and he blew the house down and ate the little pig. The second little pig was going along the road when he met a man stacking a big pile of sticks. The second little pig asked the man "May I have some of those sticks to build myself a house?" The man gave them to him and the second little pig built his house of sticks. Then one day the second little pig heard a knock at the door. It was the wolf, and he said "Little pig, little pig, let me come in." The little pig said "No, no, I won't let you in, not by the hair on my chinny chin chin." The wolf answered "Then I'll huff and I'll puff and I'll blow your house in." Then he huffed and he puffed, and he puffed and he huffed, and then he blew the house down and ate the little pig. The third little pig was walking on the road when he met a man with a load of bricks. The little pig asked him for enough to build a house. The man agreed and the third little pig built a strong house of bricks. The wolf came and knocked at his door and said "Little pig, little pig, let me come in" and the pig said "No, no, I won't let you in, not by the hair on my chinny chin chin. "Well," said the wolf "then I'll huff and I'll puff and I'll blow your house in." So he huffed, and he puffed, and he puffed and he huffed, and he huffed and he puffed, but he couldn't blow the house down! The frustrated wolf said "Little pig, little pig, I know where there's a nice field of turnips." The little pig asked "Where?" The wolf answered "At Mrs. Smith's farm, we can go there together tomorrow at nine o'clock." The little pig nodded and said "Nine o'clock, I'll be ready!" The next morning the pig got up earlier, at eight o'clock, and went to Mrs. Smith's farm and got all the turnips he could carry and was home again before nine. The big bad wolf came around at nine o'clock sharp and asked "Little pig, little pig, are you ready?" but the little pig said "I've already gone to the field and gotten some turnips, but thanks anyway." This made the wolf very mad, but in a calm voice he said "Very well then. By the way, I know where there is a nice, ripe apple tree." The little pig asked "Where is it?" The wolf answered "It's in the orchard across the field. I will come tomorrow at eight o'clock and we can go together to pick some juicy sweet apples." The little pig then said "Eight o'clock, I'll be ready." The next morning the little pig got up at seven o'clock, ran to the apple tree across the field in the orchard, climbed up the tree and started picking apples. Suddenly, he saw the big bad wolf coming. The sneaky wolf said "How are those apples?" The pig answered "Great, here catch one!" and he threw it so far away that while the wolf was going after it the pig jumped out of the tree and ran all the way home. Later on the wolf came knocking and said "Little pig, little pig, there is a fair in town, can I come by tomorrow at seven o'clock and we can go there together?" The pig replied "Seven o'clock, I'll be ready!" But the pig went to the fair earlier and bought a butter churn barrel. On his way home from the fair he saw the big bad wolf coming up a hill. The little pig hid himself in the barrel, which accidentally fell over and rolled down the hill. It rolled so fast that it scared the wolf into running away; he didn't even get to go to the fair. The little pig ran home with his churn and was safe. Later on the wolf went to the pig's house and told him about the fast rolling barrel which had scared him. The little pig laughed out loud and said "I bought that barrel at the fair and I was inside it when it came down the hill." This made the wolf furious and he said "LITTLE PIG, THAT'S IT, I'M GOING TO COME THROUGH YOUR CHIMNEY AND EAT YOU!" But the pig made a giant fire in the fireplace and put a big pot of water on it. Just as the water started to boil, the wolf started coming down the chimney and the little pig took the cover off of the pot and the wolf fell in. The little pig cooked him, ate him for dinner, and thought to himself "I'm not so little any more!" and the pig lived happily ever after.